Born February 15, 1954 in Portland, Oregon. He spent most of his childhood and youth in his native city, where he did not excel in his studies, but where his aptitude for drawing was already outlined. In the mid-80s he moved to Los Angeles where he began to draw comics. His first strip is titled 'Life in Hell' published by some newspapers for which he works, including the Los Angeles Reader, where he knows what will later become his wife Deborah Caplan (from which he will divorce 19 years after). The year of change is 1988, when he meets producer James L. Brooks, looking for the latter, a 'fill' for the program 'The Tracy Ullman Show'. And it was just a strip of 'Life in Hell' that gave Groening the chance to create his first animated short, eventually titled 'The Simpsons'. The animated product is made in such a hurry to make Matt choose the names of his family as names to give to their characters. The rest then is history. To date, in fact, the animated series The Simpsons is one, if not the most popular animated product on the planet. 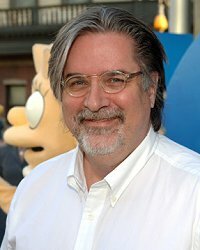 In 1999 he also found the time to produce another animated product: Futurama, a splendid and pungent satire set on a still unwritten future. After years devoted to the television series finally finds the time to conceive, in the end, a feature film always dedicated to his most famous work. After 18 seasons of the animated series, in 2007 sees the light The Simpson - The Movie. The 2018 is the year of his third and new series, "Disenchantment", produced by Netflix.